Meribel Mottaret . Chalet Elodie is in a superb location situated in the same large freestanding chalet building as Chalet Andre, near the top of Meribel Mottaret. The lifts can be accessed from a blue run, which is just 120m (approx.) from the chalet. Alternatively beginners can walk to the lifts which are just 250m away. 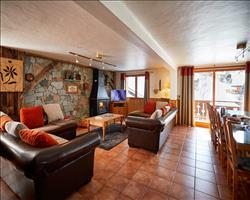 Chalet Elodie is a cosy chalet in a truly ideal location for a ski area of this calibre. 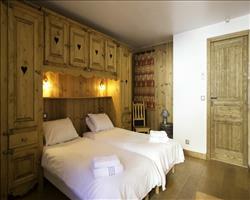 All bedrooms are en suite and decorated in a simple Savoyard style with modern bathrooms. The variety of rooms (and half price places for children) on offer make it perfect for a family or group of friends. 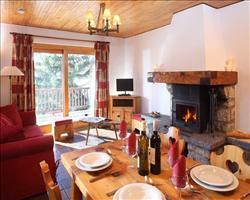 There is a lovely stone central fireplace and a large balcony making this chalet a real gem. Please Note : 2019/20 season Chalet Elodie will be a 3+ grade property. Room 2 if the third bed is occupied by a child aged 2-11 years they pay half the adult full price. Room 5 add £3 pp/pn. If occupied by 3 adults deduct £3pp/pn. If the third bed is occupied by a child aged 2-11 years they pay half the adult full price. In this case the room supplement does not apply. We update Chalet Elodie's details often, but facilities do change. e.g. some extras listed by the supplier as "free" or included might only be for the first time you use them, or for one time per party, then charged for further use. If any specific feature is essential to your holiday, make sure you ask us to confirm the details of it before you book your holiday. This all inclusive holiday to Chalet Elodie in Meribel & Mottaret, France departs Saturday 14th December 2019, for a 7 night stay on a "catered chalet" board basis. A local tourist tax (Taxe de Sejour or Kurtaxe) is levied by many councils in European ski resorts. It varies by standard and type of accommodation and is age dependent, so not everyone is charged. It's not included in the basic price of your holiday and is usually paid locally. For reference, the average charged in winter 15/16 was between 50p and £2 per person, per night. Meribel & Mottaret lift pass price last reported as €212 (adult 6 day). Ask for a quote when booking Chalet Elodie. Chalet Emilie Meribel & Mottaret France, Gatwick to Lyon 14th December. 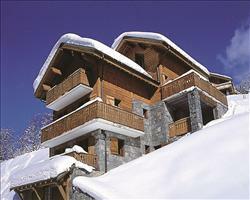 Chalet Daurel Meribel & Mottaret France, Gatwick to Lyon 14th December. 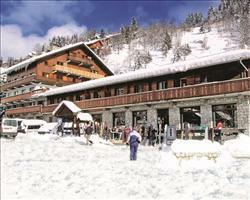 Chalet Leopold Meribel & Mottaret France, Gatwick to Grenoble 14th December. Chalet Andre Meribel & Mottaret France, Gatwick to Grenoble 14th December. Chalet Etoile des... Meribel & Mottaret France, Gatwick to Chambéry 14th December. 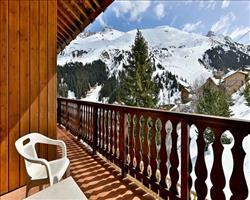 Chalet Hotel Les ... Meribel & Mottaret France, Gatwick to Chambéry 14th December. Lovely chalet. A good size as a pair and in a good location. I fact on the right day you can ski to the door. Otherwise the piste is VERY close. There is a blue literally 20m from the front steps of the chalet. The room I had was well appointed and clean. The bathroom was top notch. Our host (Ben) was amazing. Okay so the host isn't the same every year, but this season the food will be good and the company better still. "Cheeky off-piste ski to door"
This chalet has been recently refurbished and is a great location. If you don’t mind a bit of cheeky off-piste you can literally ski to the door. The slopes are about 5 minutes away up a set of chairs and across a small car park so really quick to get out in the morning. There is a cute living area with a fireplace and TV, nice to hang out there in the evening. If you want to go to Meribel centre its only 15 minutes on the free ski bus (about 3 minutes away) which ran till about 12am when I was there in winter 2012/13. A great bar in Meribel is Barometer, the staff are lovely and it sells Mutzig, a very strong local beer! "Ski close to the property"
Attached to the Chalet Andre, this attractive chalet is very well placed for those who don’t mind walking a couple of minutes in either direction. Skiers only have to walk 130yards to a blue run before sliding down the mountain to the chairlift, while beginners have to go a further 110yards to the bottom of the piste. With the resort centre a cheeky five minutes’ walk from the front door, it is a refreshing way of seeing the town and the surrounding area in all its beauty. Can sometimes be requested with flexible catering, but you must enquire about this before you book.